People sometimes wonder how Esperanza is heated: today an oil furnace and steam heat. However, there was a gravity feed hot air system in the north end of the house from its construction in 1893 to the 1960’s; in addition to the steam heat system in most of the rest of the house*. 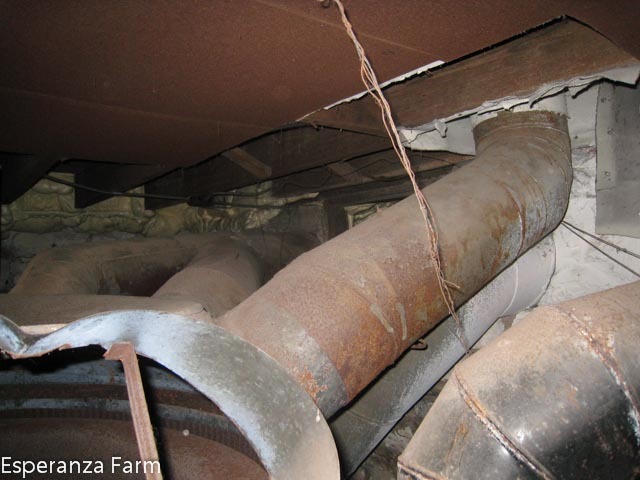 The air was heated by a coal fired furnace in the basement; the duct work ran (and still does) throughout the upper two floors. 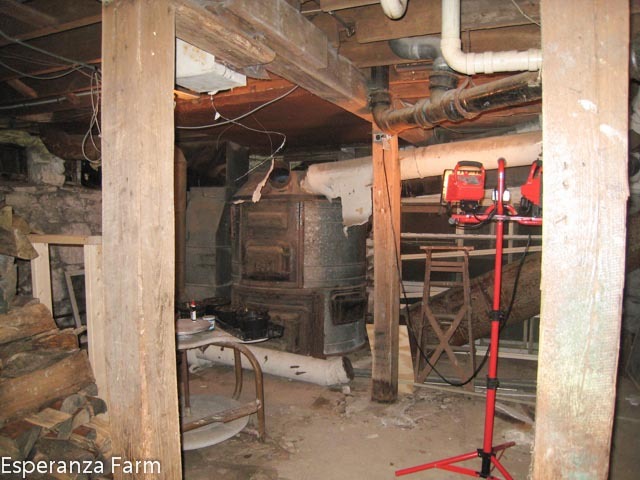 The furnace still occupies a large portion of a basement room, being about 7 feet tall and four feet wide. Originally, there were eleven ducts coming either into or out of the furnace, and some ran at about six feet off the floor. Wrapped in white insulation*, which over the years had sagged, snaking off into crawl-spaces, and being in a very dark space, it is not entirely surprising that it earned the term the Octopus. A few years ago, one of the cats ended up in the ducts (he fell through a hole in a main duct) and several of the lowest arms ended up being removed in the process of attempting to get him out. That, combined with corralling the insulation, has made it much less spooky. Some times people argue that we ought to take it out, as it is utterly unusable*. But, I have to admit that I have grown to like it down there. Not simply as a personality, but because it adds ‘character’. I kind of like spooky houses. Besides, why take it out if it doesn’t bother one? two of the ducts are already off in this photo. looking across the top at the ducts heading into crawl-spaces, the hole on the bottom left is a removed duct. *There is no heat in some of the house. *Yes, it is asbestos; yes, its fuzzy; no, I am not dead; yes, this tends to make me somewhat sceptical about certain ‘green’ screeds. *The bottom of the fire-pit no longer exists….in the spring there is a nice bit of groundwater there…. Doubt the danger? No. React like a screaming idiot? No. There is a difference. “Spooky” indeed: That whole basement terrified me when I was little. It took all the courage I had to walk through it; usually I went through at a dead run, if at all. And I quite agree with John on the asbestos! Lovely stuff when hard, really nasty when inhaled.